I was thinking about an old friend, Alden Nowlan, earlier today when Dan and I were recalling a drive in rural Nova Scotia where we came across his birthplace. We reminisced a bit about his memories of the place. The conversation reminded me of a column I'd once written about him and I decided to share it. We'd also been talking earlier in the week about rural poverty and I've written recently about vinegar and about molasses – so this column touches on a number of recent references. It was written for The Daily News in 1990 and some of it is dated because it's about summer theatre productions way back then. I enjoyed remembering them anyway. Maybe you saw those productions also and if so, maybe you'll enjoy this too. Whenever poet Alden Nowlan was asked where he came from, he would answer – his gravelly voice booming – “I am from Desolation Creek, Nova Scotia.” There were people who believed him and went home to look it up on their maps, but mostly, people understood that he was speaking metaphorically and in general, they didn't really care much where he came from. The question was polite, a form of small talk. Alden came from an area of rural Nova Scotia that was hopelessly poor. It was something he talked about often, the brutalizing effects of such poverty, the despair of the people who saw no way out. His friends heard many times about childhood winters when his family had only potatoes to eat, seasoned today with vinegar, tomorrow with molasses, the next day with simple salt and pepper. Served with tea. People loved to be shocked by the realization that one of Canada's most distinguished poets had left school in grade five to work in the woods and in the mill. 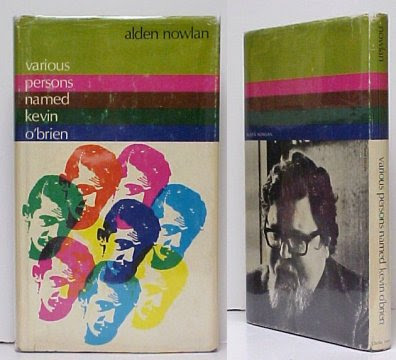 During the '70s, Alden published his only novel, Various Persons Named Kevin O'Brien. It was the story of a young man growing up in rural Nova Scotia, dealing with a brutal father, understanding that he, Kevin, would have to escape from the life he was expected to live. As all writers do, he insisted that the book was fiction, based on some actual incidents and characters from his own life. Most people who had talked to him and listened to his stories believed, however, that Kevin O'Brien was Alden Nowlan and that this was the story of his own life. When the book was published, I think he had long since come to understand, to sympathize with, and to have forgiven his father – “poor old bugger,” he used to call him. Alden had no fewer human failings than anyone else but he was a compassionate person, knowing that extreme poverty sours the soul, able to exorcise the bitterness he had carried because of the harshness of his own deprived past. He had made his peace with his father and through that, had made a start on making peace with himself. Alden died in the early '80s. 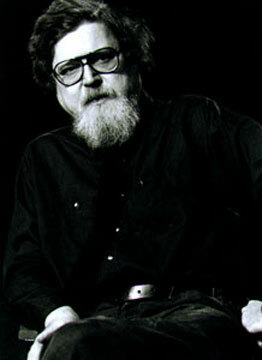 By the mid-'80s, Paul Hanna, a “theatre person” who had been active with TNB for a number of years, had completed a first draft of a play called Lockhartville (the fictional community where the fictional Kevin O'Brien was from), based on Various Persons Named Kevin O'Brien and incorporating some of Alden's poems. Tragically, Paul died very suddenly at the age of 37. The play was taken over by Terry Tweed who workshopped it with six actors provided by TNB. It was produced for the first time in New Brunswick in 1988. This month, it's playing in Parrsboro at The Ship's Company Theatre. It's a wonderful piece of work. Acting, direction, set design – all are superior but, as everyone knows, the best actors in the world can't save a production if the writing is poor. This is Lockhartville's major strength. The play is stylistically unconventional – the young Kevin O'Brien and the adult Kevin appear together, for instance – but it's also realistic and rings true. The poems, including two of Alden's best known – Ypres 1915 (pronounced “Wipers” as Alden's father pronounced it) and The Bull Moose – are incorporated with a naturalness that is nevertheless dramatic. This is the second summer in a row that my best theatre experiences of the season have happened in Parrsboro. (Last year, it was To Far Away Places, the story of Joshua Slocum's round-the-world journey.) Of course, it's a novelty to go to the theatre in a beached, restored ferry – the Kipawo – but without a good production, that novelty would soon wear off. It's no accident that the best theatre in Nova Scotia is being presented by the smaller companies. Nova Scotia is not unlike other centres around the country, where the larger theatres are floundering for lack of money, are at the mercy of board members whose first concern is the bottom line, and are forced into producing conventional, recognizable comedies and musicals, seen to be guaranteed moneymakers. But both the Parrsboro plays I've mentioned, as well as a couple of others, are more than worthy of Neptune's main stage and I'd love to see them there. I won't hold my breath though. Meanwhile, Lockhartville will play in Parrsboro until the end of this month. It's worth the trip. It amazes me the influence Alden had in our lives. We knew him for such a short time and yet his presence feels as real today as it did back when. Kyran named her first son for Alden. He did two novels, the other, THE WANTON TROOPERS, was written before Kevin O'Brien but published after his death. It's the better of the two, in my view.